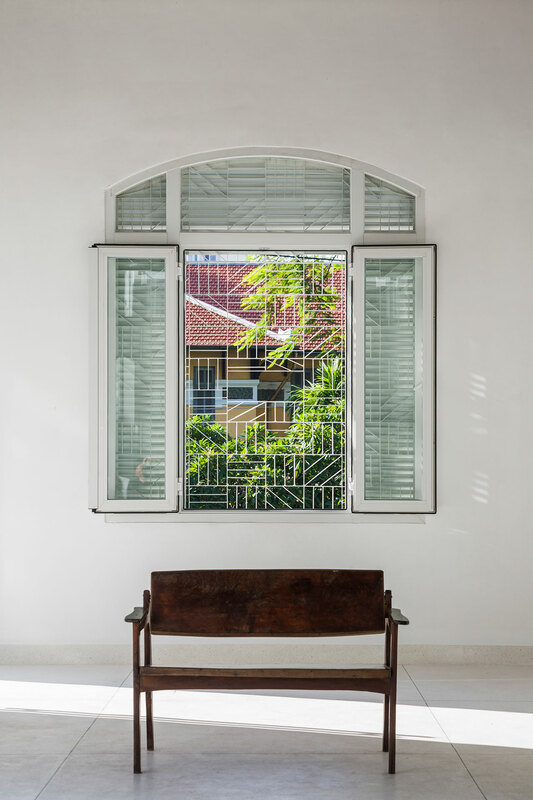 Commissioned to renovate a friend’s colonial villa in the heart of Ho Chi Minh City, Vietnam, Vietnamese architectural studio Kientruc O applied a subtractive logic in order to create D House, a home of contemporary elegance that looks inwards for comfort and serenity. 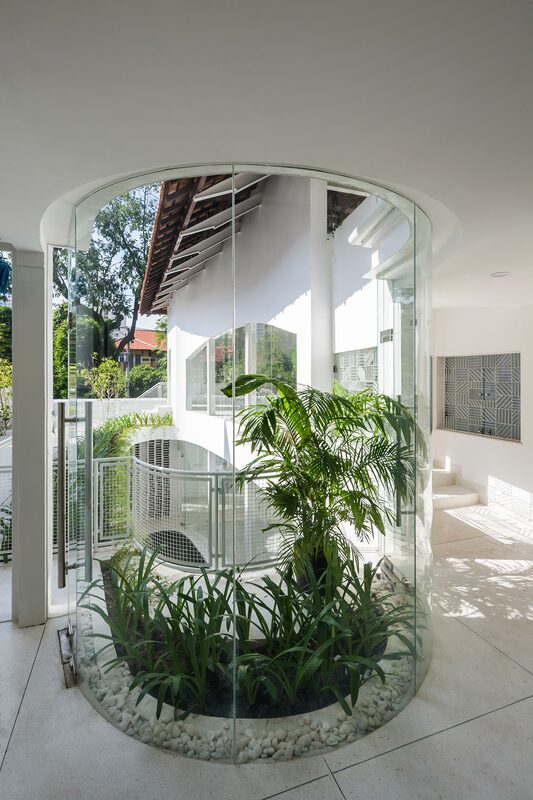 Confronted by the hassle and bustle of a busy road, the renovated property, which includes a 1940s two-storey house made of brick as well as a 20 years-old four-storey steel extension, turns its back on its urban surroundings focusing instead on an internal atrium that the architects have carved out of the existing buildings. 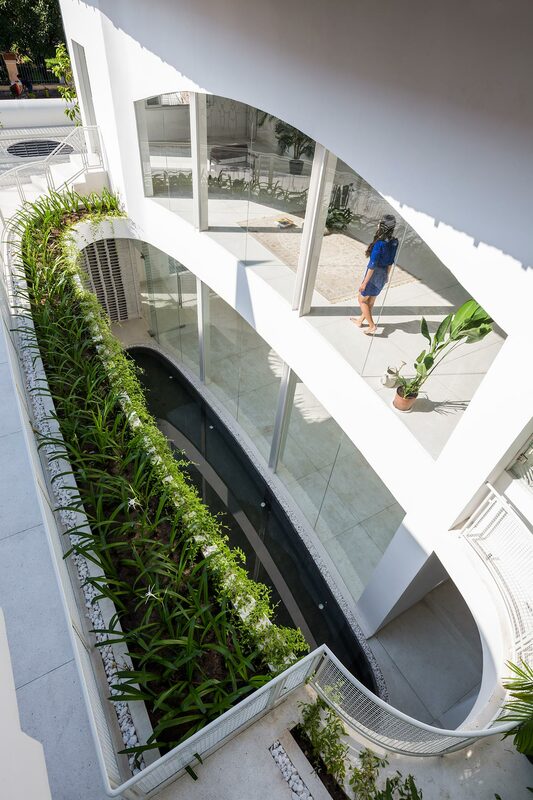 Elliptical in plan and elongated in length, the atrium gently trims the front façade of the older house and sculpts a vertical gap in the middle of the newer structure. 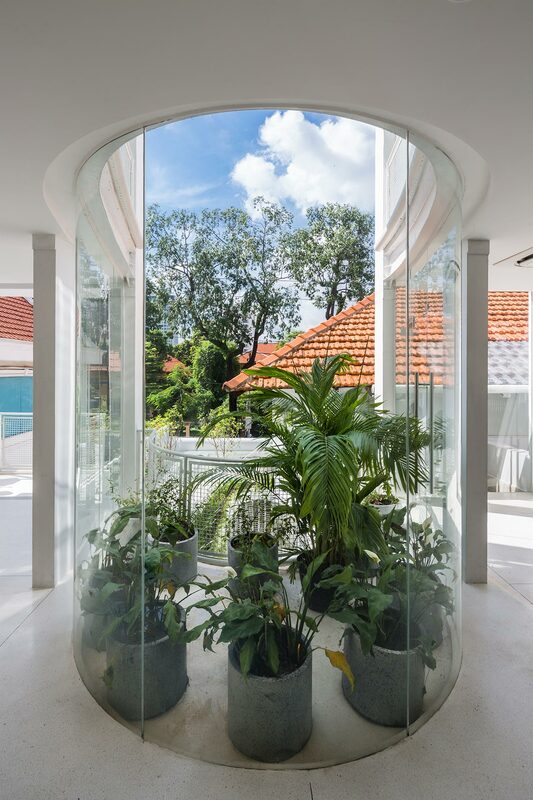 More than a focal space, it also acts as a light-well with curved glazing running along its perimeter where it meets the buildings, as well as a notional hanging garden with vegetation planted along its periphery at multiple levels. 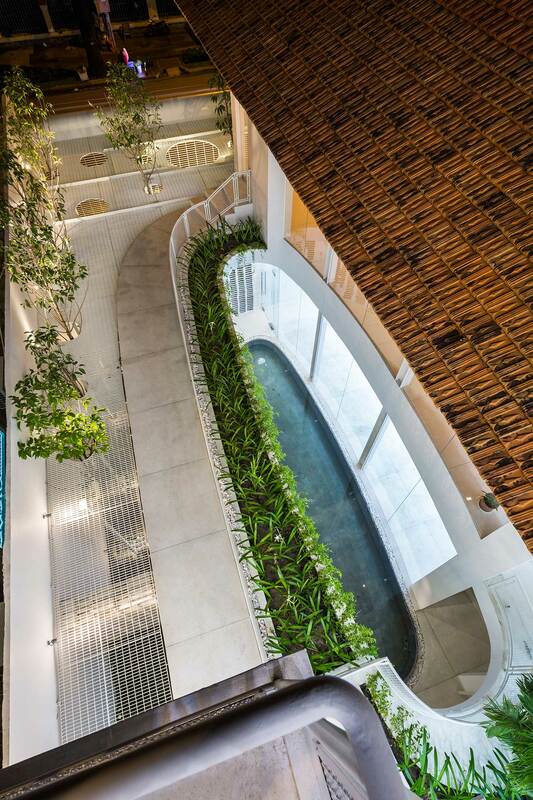 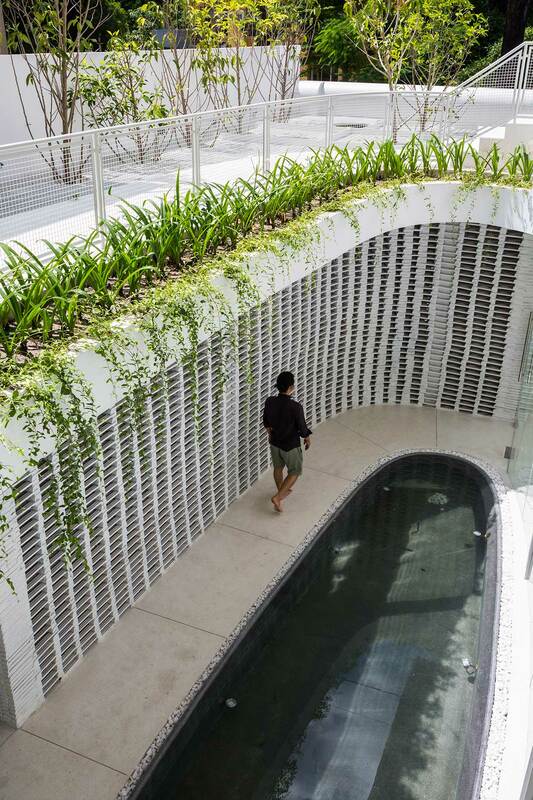 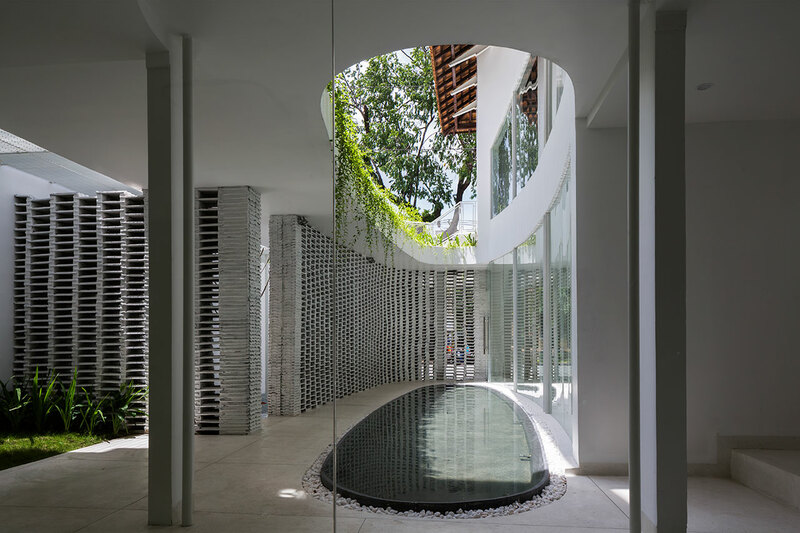 At the atrium’s bottom, an elliptical reflecting pool is shielded by the busy road by a perforated wall of stacked white tiles that wraps around it creating a secluded, serene communal space. 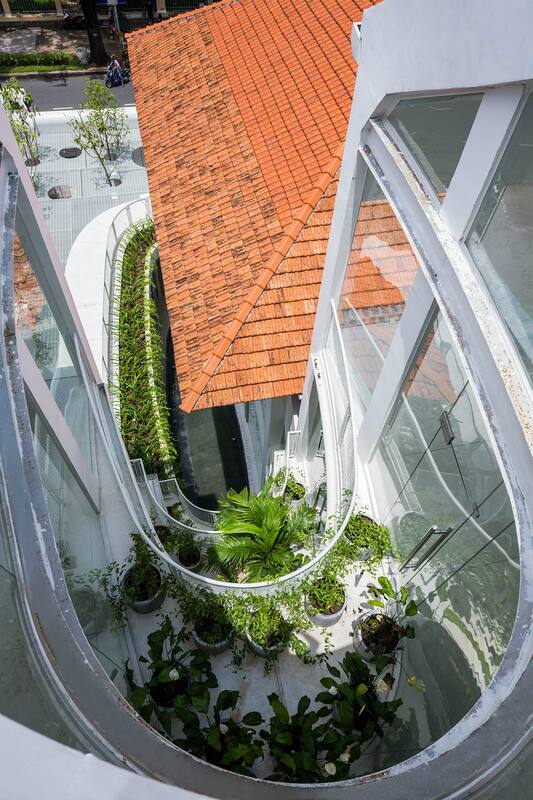 The filigree-like texture of the stacked tiles is picked up by the gridded white metal roof that covers the street-facing space on the other side of that wall, which, seen from the upper floors, blocks out the un-built area to accentuate the well’s shape. 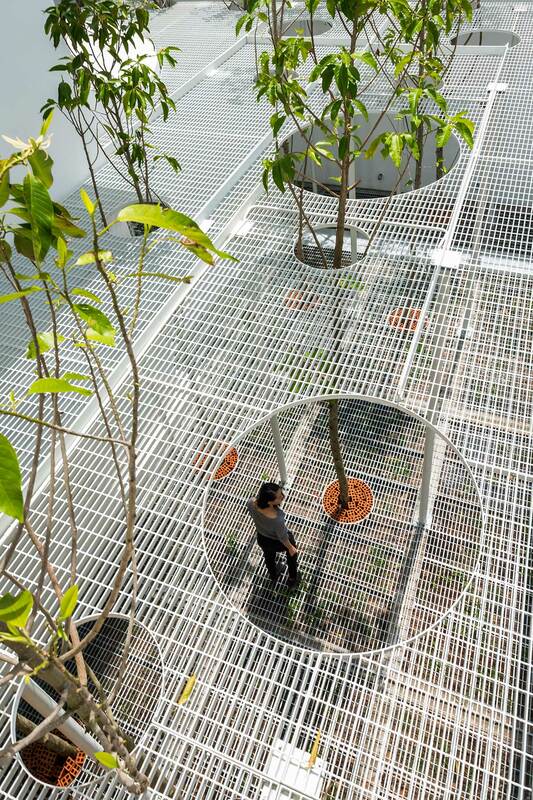 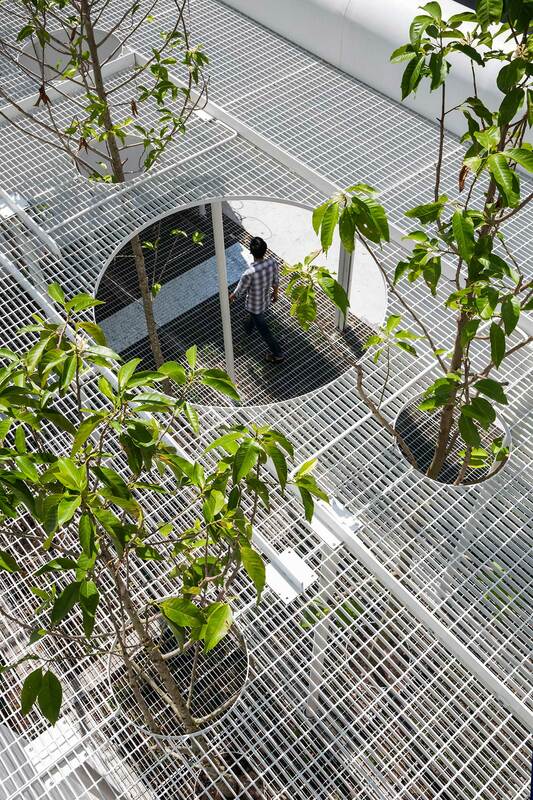 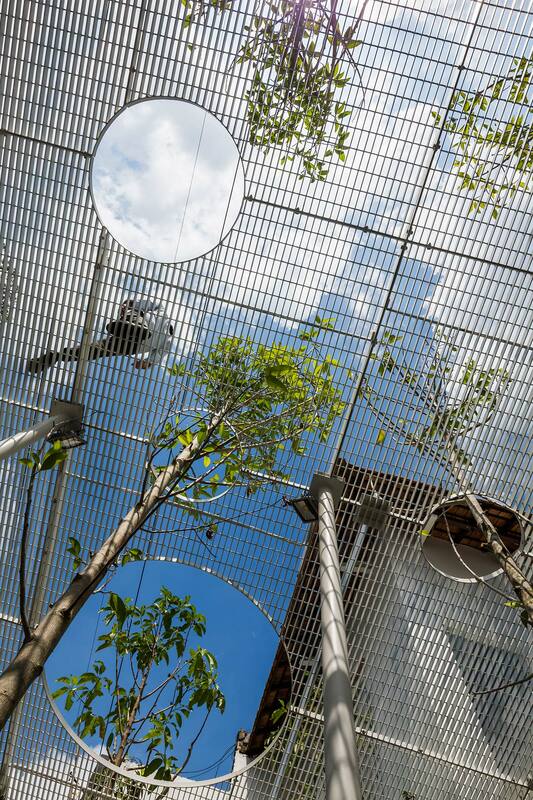 Specially designed holes allow the trees on the ground level to grow through this metal lattice, creating a soil-less planted area on the floor above. 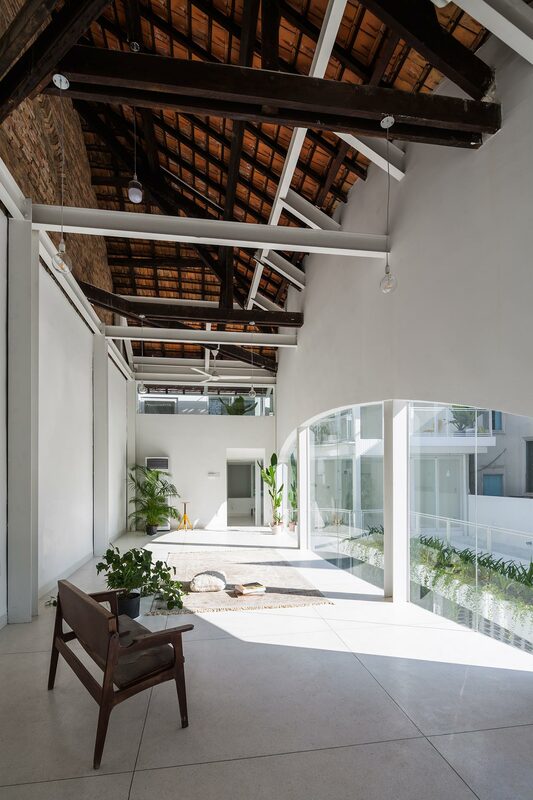 The interiors sport a minimal aesthetic of white-painted walls and pale floor tiles beautifully juxtaposed with the exposed structure of the existing gable roof and its supporting brickwork on the first floor. 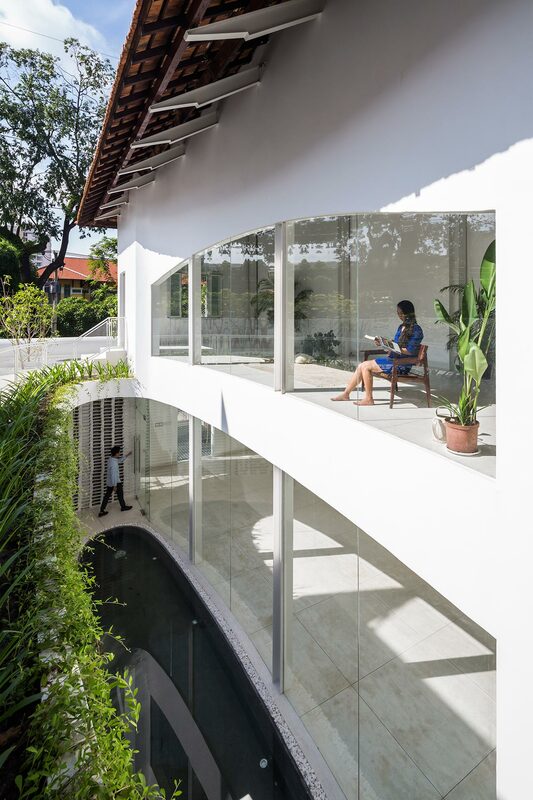 Ultimately, it is this finely-tuned balance of past and present, old and new, which perfectly reflects the graceful equilibrium between void and solid that this house’s subtle design hinges upon.